Historical researcher Sarah Chaney is attached to the University College London Health Humanities Centre and The Queen Mary Centre for the History of Emotions. Her Psyche on the Skin: A history of self harm is a well-written, clearly-organized, and entirely intriguing, account of some of the range of ways bodily self harm has been perpetrated through the course of history, where bodily self harm can be loosely characterized as involving intentional, although not always willful or voluntary, tissue damage at one's own (and sometimes others') hand. Separate chapters focus on seven distinct themes. These are: ancient examples of normative (and mainly male) castration, paired with the customary bloodletting employed in medicine until the twentieth century; the identification and treatment of what came to be regarded as the pathological category of self mutilation in the emerging psychiatry of the nineteenth century; the medicalization of masturbation and its accompanying emphasis on self control in late Victorian Britain; fin de siècle ideas about dissociative states, and hysterical attention seeking; psychoanalytic concerns over the death instinct and masochistic behavior during the first half of the twentieth century; the category of delicate cutting as it related to conceptions of borderline conditions in post-war North America, and finally, in her nicely entitled seventh chapter (Trigger Happy) focus on the assumptions underlying emotional triggers, Internet-driven 'contagions' and other twenty-first century phenomena associated with a cutting and self-harming culture. Each of these broad themes is illustrated through attention to particular cases, told in some detail, and by appeal to a literature where self harming behavior is explained or interpreted in the particular, often very local, cultural setting under discussion, such as Victorian Britain, or post-war North America. The sheer breadth and seemingly arbitrary selectivity of Psyche on the Skin is at first unsettling. If we were looking for a work that defined self harm in such a way as to show why these particular practices and examples were chosen - why, for example, self harming eating disorders were excluded, as were any grouping corresponding to the diagnostic categories of psychiatry - we would find Chaney's approach insufficient. But that would be to entirely miss the point. The diverse themes and particular cases explored here are a demonstration of precisely the main idea, enunciated and reiterated throughout the book, which Chaney calls the myth of objectivity: there is no reason to suppose self harm is a coherent category at all, let alone a natural or scientifically identifiable one. Until the emergence of psychiatry in the nineteenth century, these sorts of behavior do not even seem to have been assigned to any kind of category. They served religious, economic, aesthetic, communal and societal purposes specific to particular contexts, and were not even consistently focused on the modern world's conceptions of an individualistic self (leaving such harms characterized as self harm only in the loosest sense). The palace eunuchs and Vatican castrati, the fasting women in the cloister, the cutting girls of our own era, have each harmed their bodies. But they have done so for reasons differing with the context in so many separate respects that the notion of any unchanging, underlying, universal disease process as the progenitor of their behavior seems patently misleading. This approach affords Chaney an opportunity to beam in on particularities in two ways. Introducing valuable medical and non-medical primary source material, she shows the prevailing ideas that influenced interpretations of self harm within the local contexts from which her cases are drawn. (For example, the 'genderless ideal' guiding ideas about castration at the time of early Christianity, she points out, lacked our close present day associations between sexuality and self identity. Similarly, the present day idea that painful flashbacks of earlier trauma can be triggered by external events, she notes, assumes an individualized and internalized concept of trauma, and reflects the way self harm has increasingly been construed as an individual, psychological phenomenon.) But she also offers enough detail and background to capture the uniqueness of the individuals whose behavior she describes, and uses their own words, as well as those of their treaters. One such case is that of Honora Downey, a patient at the Boston Psychopathic Hospital during the first decades of the twentieth century. While her physician interpreted her cutting as related to trauma from early psychosexual experiences, she wrote of suffering a "crazy headache" and thinking that "after I had let blood my headache went away, … the cutting of my wrist, and letting the blood flow had cured it"; also, unhappy with her size, she reported that she "thought bleeding would reduce fat" (quoted on page 153). A second case, closer to home, is Chaney's own. Although sparingly, and less for detailed analysis than to confirm her credentials as a survivor of the effects of psychiatric care, she reveals her personal history with self harm. There is no central phenomenon of self harm, according to the decentered approach illustrated by Chaney. There are just a range of different contexts and particular cases loosely linked by the superficial similarities between the tissue damaging effects they share. This position is a refreshing counterpoint to the individualistic, psychological focus of modern-day psychiatry. The only rejoinder must be that of psychiatry as an immature science that can be expected to one day either uncover neurological underpinnings uniting this collection of self harming behaviors, and provide a definitive rebuttal of all the false starts and misinterpretations that have accompanied them through the years - or else entirely prove that, as Chaney surmises, there is no commonality. Meanwhile, however, we are prompted to apply the approach to other categories associated with mental disorder in our own time, and Chaney identifies two, as she moves through her discussion: suicidal behavior, and social contagion. Because her primary examples are not life-threatening ones, Chaney only discusses suicide in passing, but she does note the more nuanced understandings of the goals and meaning of suicidal behavior emerging during the second half of the twentieth century. The history of suicide, and the very definition of suicidal intent, readily submit to a comparable analysis. Since its meaning, causes and nature are as diverse and contextualized as self harm, the closer we look, the less we seem inclined to regard suicide as a coherent category. Moreover, especially since the new technologies have transformed social communication, the allied concept of social contagion is often subject to the same misapprehensions, Chaney suggests. Social contagion is used to explain self harm, as it has long been to explain suicide. Yet the meaning of contagion itself is unclear and shifting, and the role played by the Internet is particularly complex: "The myriad worlds that people inhabit and the different ways they represent themselves – through social media, online communities, blogs and newsrooms – demand an entirely different way of thinking about people and their interactions with one another." Rather than shifting conclusions from one field to another, "we must acknowledge that an entirely new set of rules may apply" (page 235). Perhaps it goes without saying that self harm can be expected to be painful. And if Chaney's analysis has a fault, it lies in her limited attention to the feelings and sensations associated with these practices. In this respect, she misses an opportunity: just as explanations and meanings of self harm will vary with the local historical, social and cultural context in which they occur, so must experiences of pain and suffering themselves. Added support for the variability of the phenomena involved would have been provided by explicit focus on variations that are present in her examples, but go unremarked: the way such experiences are mediated, apparently often to the point of anaesthesia, through features of the extra-sensory and extra-personal setting. A minor concern with this volume lies with the illustrations. Threaded throughout the text are black and white photographs, often of poor quality, and sometimes of limited relevance. (For example, a large photograph of the Boston Psychopathic Hospital would have been warranted by a more thorough history of that institution, but it shows up in this text as little more than the setting of a detailed case discussion.) Entirely valuable, on the other hand, is a list at the end of the book showing resources for those who may require help for self harming behavior. 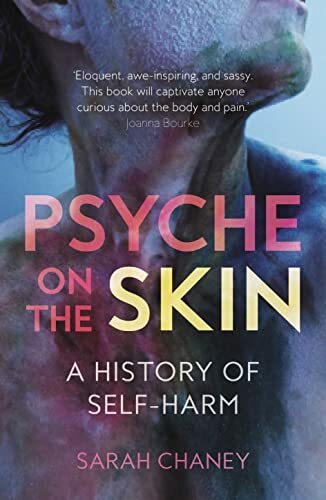 In conclusion, Psyche on the Skin is a fascinating and impressive piece of social history and analysis. Equally illustrative and didactic, it is a compelling "argument against a universal model of self harm." It is also a model for how to approach other categories that have been caught up in the maw of psychiatric reductionism, certainly eating disorders, but perhaps even mood disorders like depression. For those skeptical or concerned over present day ideas about mental health and illness, including practitioners, mental health service users, social historians and philosophers of psychiatry, this is a valuable contribution.